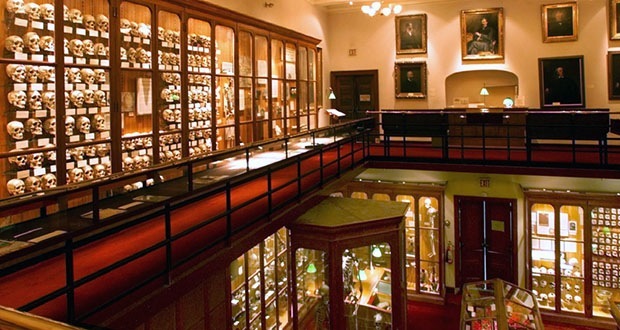 The Mütter Museum is best known for its unique collection of medical oddities and anatomical specimens such as a wax model of a 19th-century Parisian woman with a six-inch a horn growing out of her forehead. The Mütter Museum also contains the famous Hyrtl Skull Collection, the skeleton of a 3 foot 6 inch dwarf, and the tallest skeleton (seven and a half feet tall) currently on display in North America. Other unique specimens include a nine-foot long human colon from a man who was so bloated that he was called the Human Balloon when he appeared as a sideshow act, a collection of teratological specimens (preserved human fetal specimens), the liver from the famous Siamese twins Chang and Eng Bunker, slides of Albert Einstein’s brain and a malignant tumor removed from President Grover Cleveland. 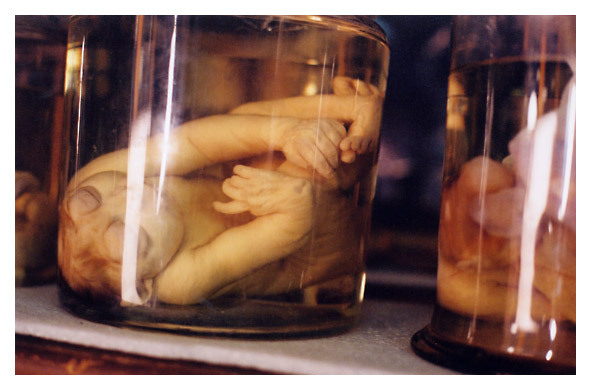 The Mütter Museum also has jars of preserved human kidneys and livers, and a collection of human skulls eaten away by tertiary syphilis, dried severed hands, and the corpse of a two-headed baby. Most of this unique collection of medical oddities and equipment was donated by Dr. Thomas Dent Mütter in 1858. The Mütter Museum acquired the Hyrtl Skull Collection in 1874 from Josef Hyrtl, who sold his anatomical collection after his retirement. The collection was initially used to train medical students, but is now on display in the Mütter Museum, as its mission has changed from solely medical education to public outreach. Over 150 years old, the Hyrtl Skull Collection contains 139 human skulls. Josef Hyrtl, who was a 19th-century Austrian anatomist collected these skulls in order to disprove the science of phrenology. Hyrtl did not believe in the phrenologists’ idea that the human brain, and therefore a person’s personality and character, was subject to changes that could be measured in the size and shape of the skull. The Hyrtl Skull Collection contains skulls from people who were mostly Eastern European or Asian and died between the ages of 8 and 80. Most of the skulls were from men, with only 14 from women. In the 1800s it was an illegal, yet privately accepted, practice for medical doctors to pay grave robbers for the corpses of the dead. The bodies of criminals, the very poor and the mentally ill, were often taken by grave robbers because they rarely had family members who were concerned with their burial. Not surprisingly, most of the skulls in the Hyrtl Collection came from executed criminals, people who had committed suicide, or people had been institutionalized because of disabilities, usually mental disabilities. However, Hyrtl’s collection is unusual in that it contains biographical information on many of the skulls. For example, the collection contains the skulls of a robber who was beheaded in Lebanon, a teenager who hung himself, a woman executed for the murder of her own child and an eighteen year old described only as a child murderer. Interestingly, this documentation also suggests that Hyrtl may have obtained bodies directly from hospital and prison officials rather than from grave robbers. America’s finest museum of medical history, the Mütter Museum is located in Philadelphia, Pennsylvania, and displays its beautifully preserved collections of unique medical oddities, anatomical and pathological specimens, wax models, and antique medical equipment in a 19th century “cabinet museum” setting. 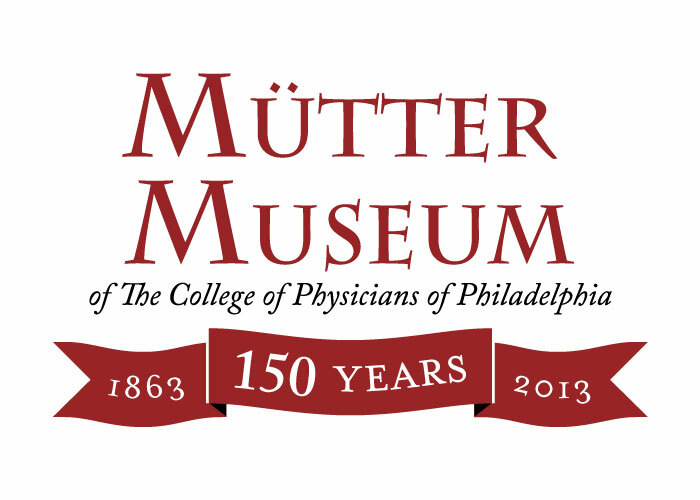 As part of The College of Physicians of Philadelphia, the Mütter Museum’s original purpose was medical research and education, but more recently its mission has shifted to public awareness. 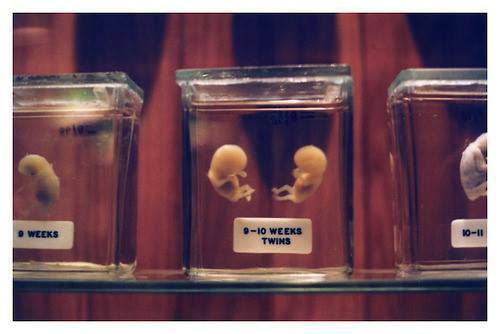 The Mütter Museum has shown a steadily rising international popularity, with a recent documentary on the Discovery Channel and the subject of two best-selling books. 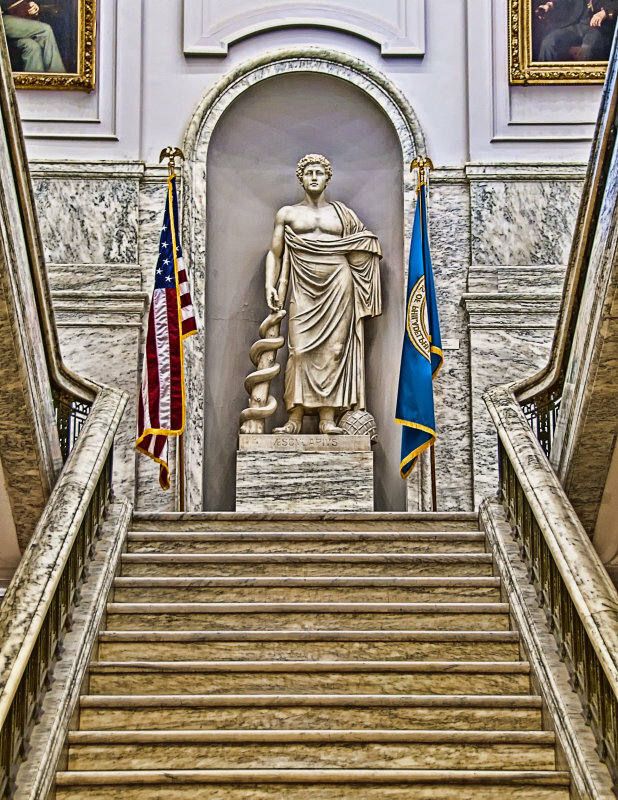 The goal of the Museum is to help the public understand the mysteries and beauty of the human body while appreciating the history of diagnosis and treatment of disease. The Mütter Museum is open 7 days a week from 10AM – 5PM except on Thanksgiving, Christmas Eve, Christmas and New Year’s Day. General admission is $15. This entry was posted in Uncategorized and tagged Albert Einstein's brain, anatomical specimens, antique medical equipment, cabinet museum, Chang and Eng Bunker, College of Physicians of Philadelphia, Discovery Channel, dwarf, giant, grave robbers, Grover Cleveland, Human Balloon, human skulls, Hyrtl Skull Collection, Josef Hyrtl, medical history, medical oddities, Museum, museum of medical history, Mutter Museum, pathological specimens, phrenology, severed hands, Siamese twins, sideshow act, Skull, skulls, teratological specimens, tertiary syphilis, Thomas Dent Mütter, two-headed baby. Bookmark the permalink.